For the last three years, a portion of my time has been devoted to digitizing a treasure trove of imagery found in the Milwaukee Art Museum’s Brooks Stevens Archive. Stevens, one of the best known industrial designers of the twentieth century, lived and worked right here in Milwaukee, his hometown. While you may not automatically recognize his name, you most certainly will recognize his work: the Oscar-Meyer Weinermobile, Harley Davidson Hydra-glide motorcycle, the Valkyrie coupe sedan, and the round mouth Holsum peanut butter jar–just to name a few! Companies of all sizes, audiences and design needs flocked to Stevens and his firm for over five decades. Brooks designed a version of virtually every item imaginable in our world–from large machines including cars, trains, boats, planes, manufacturing machinery, and engines, to items found inside and outside the home and office, such as appliances, furniture, and lawn and garden machinery. In addition to the objects themselves, he was a mastermind at advertising, tackling shoes, clothing labels, crackers, candy, batteries, and even paint cans. Among the thousands of products and marketing campaigns he and his firm designed, 8,000 images are now up in our online archive, with thousands more images on the way! Of the many images I’ve had the pleasure of encountering, my current favorite is a mysterious product called Sugar Specs. 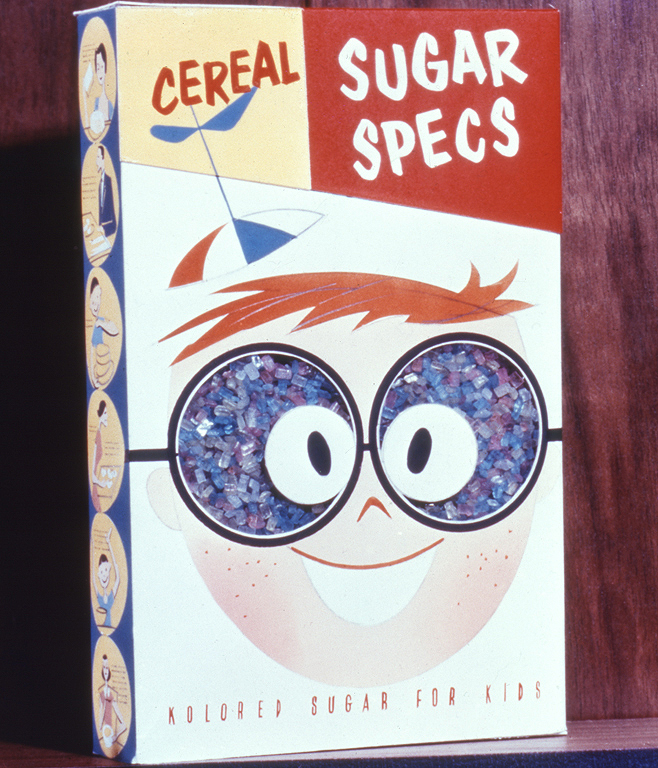 The Stevens-designed Sugar Specs box features a caricature of a young boy with a tiny beanie cap on his head and huge googly cellophane eyes, through which the product could be viewed. 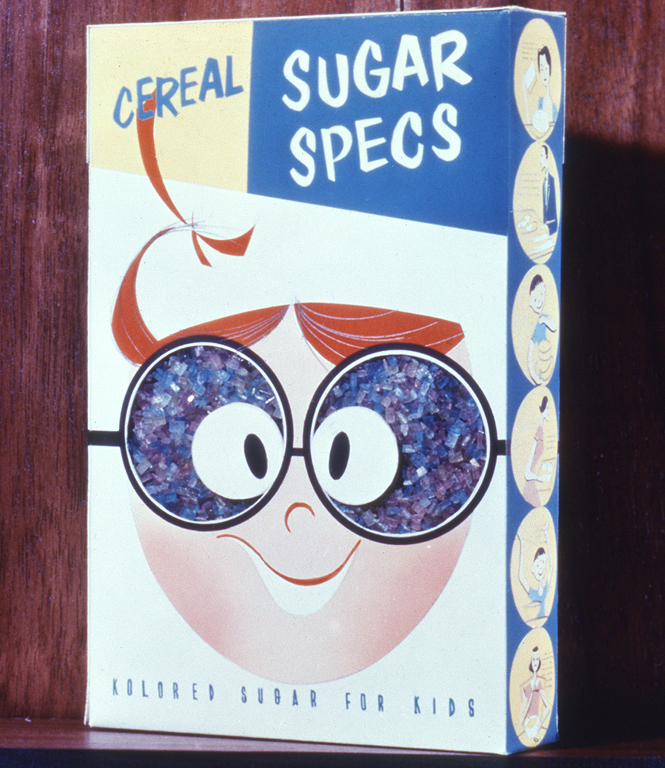 On the back of the box is an image of a girl with the same googly cellophane eyes and a pigtail, sprightly curled atop her head. Both have a telltale Cheshire cat-style grin suggesting they are under the influence of a major sugar high. In the slogan reads the product’s claim to ingredient fame–simply put, Sugar Specs was “Kolored Sugar for Kids.” Just reading the slogan made my teeth hum at the thought of how sweet it must be! With sugary sweets about to take center stage in many of our holiday activities, I must ask, are there any memories of Sugar Specs out there? 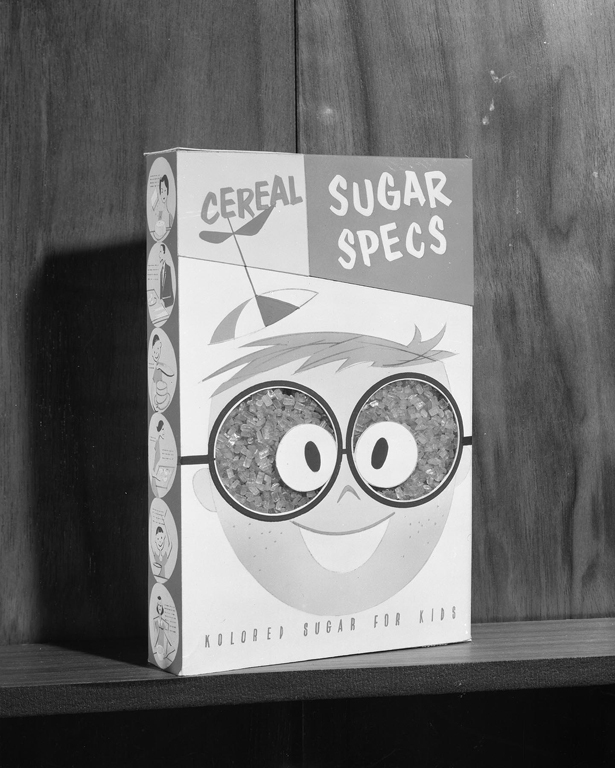 This entry was posted in Library/Archives and tagged advertising, Brooks Stevens, cereal, children, Kids, Milwaukee, product design, sugar. Bookmark the permalink. I have two boxes of Sugar Specs that I was lucky to even get, it seems that it is so obscure, that even the big kids food box and product container collectors are not even looking for them. Personally, I think they look great in my collection and am assuming that the collectors will soon be sighting these out with not much luck because they don’t come up often.